Heckington villagers are looking forward to the restarting of the church clock, which has been stubbornly stuck at four o’clock for some weeks. 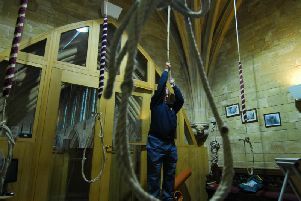 Clock repairers are due to attend tomorrow (Thursday) at 9am and should be abseiling down the 500-year-old church tower to the clock at about 10am. The plan is to bring the affected parts down to the ground for cleaning, although they will only know for sure if that is all that is needed with closer examination of the much valued village timepiece. Meanwhile, plans are progressing at the church for some major improvements over the coming years. To raise funds for the heritage work at St Andrew’s an Afternoon Tea by the Lake is being held at Wadeley Grange in Heckington on Sunday, August 2, 3pm-5pm. Places are strictly limited and can be booked by calling 01529 460272. A traditional tea will be served overlooking the lake.